Buttercream Flowers is one of the easiest and the prettiest way to decorate your cakes or cupcakes. 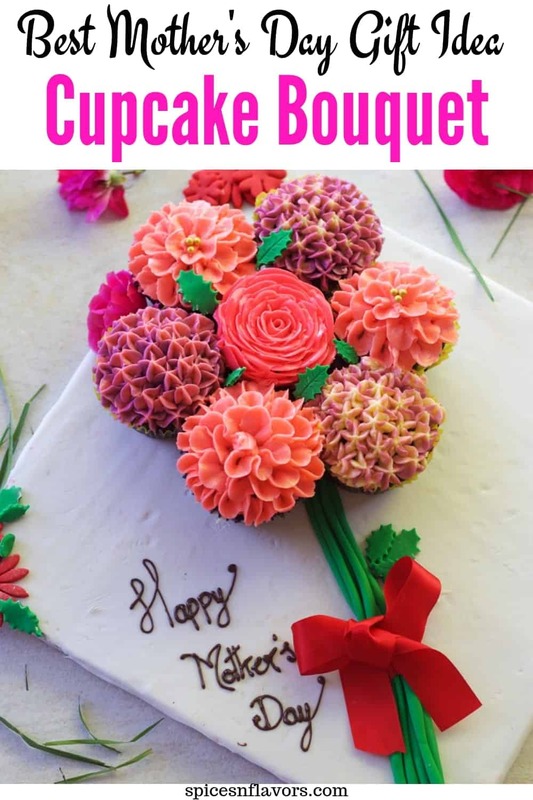 In this post find the exact steps to make not 1 or 2 but 5 different buttercream flower cupcakes decoration in a step by step pictorial as well as video tutorial format. How to make Buttercream flowers on cupcakes. This post is just perfect for someone who is just entering into the field of cake decoration. 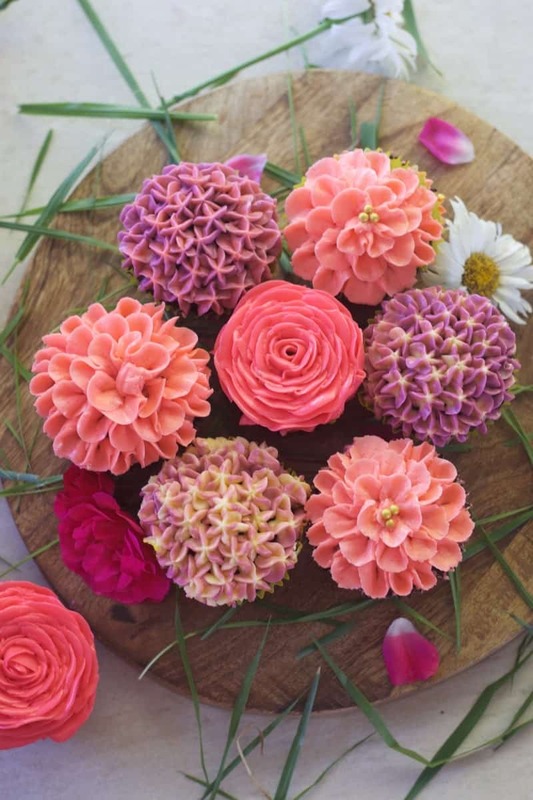 Making it a perfect post – Buttercream flowers for beginners. 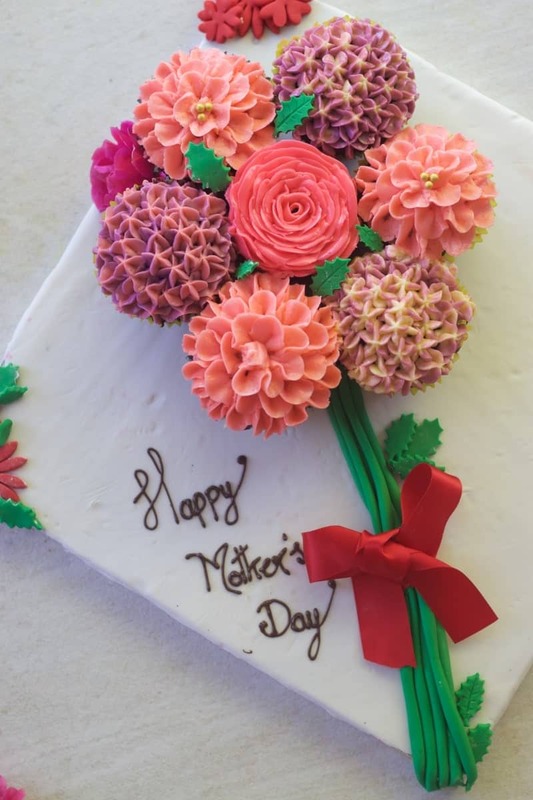 How to use Buttercream flowers for cake making or decorating – Once you get used to holding your hand steady and stiff with right consistency of buttercream this part would come naturally to you. 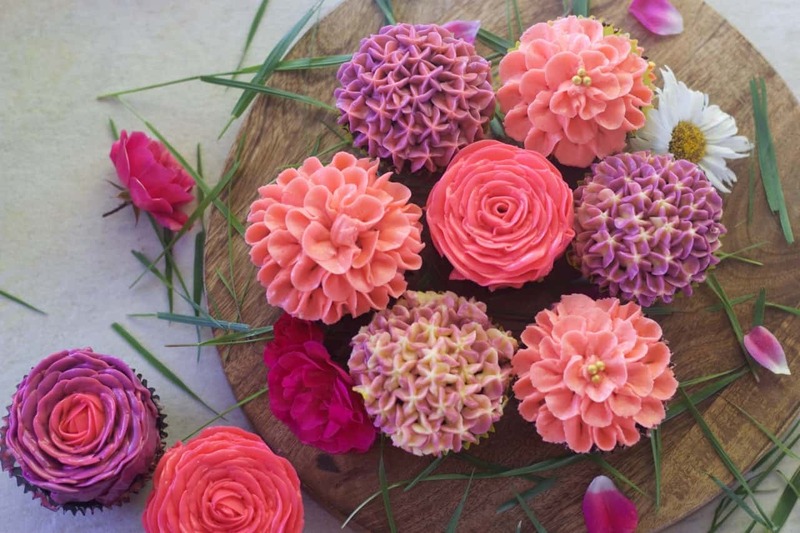 What type of buttercream works best for piping flowers? The most common type of Buttercream that works best for making a buttercream flower cake or buttercream flowers cupcakes has to be the American Buttercream Frosting. I have shared a detailed post on how to make the perfect buttercream aka Buttercream 101 in a separate post. Definitely check it out before we start making the flowers. Being sturdy enough to hold on the piped flowers, American Buttercream is most preferred frosting. The other frosting that you could use can be Swiss meringue or Italian Meringue Buttercream. However, I would like to bring your attention to my latest addiction – Condensed Milk Buttercream Frosting which is also known as Russian Buttercream Frosting. Oh my God!! If you haven’t tried it yet you should right away.. just 2 ingredients and it tastes so yum, silky smooth and just delicious. This according to me is the best buttercream for piping flowers on a cupcake. And the flowers that you make out of this are so smooth, silky and has an amazing shine to it. Also, it is subtly sweetened keeping the balance, unlike American buttercream which is just uber sweet and also has a crusting finish. Other softened buttercreams like French is just not suitable for piping flowers. Apart from buttercream, I have seen flower cupcakes made out of non-dairy whipping cream too. I have not tried it yet and also let us focus on buttercream frosting for today’s recipe keeping the whipped cream for some other day. If you were to use the buttercream for filling and frosting the cake you would prefer light and fluffy frosting that would melt in your mouth. 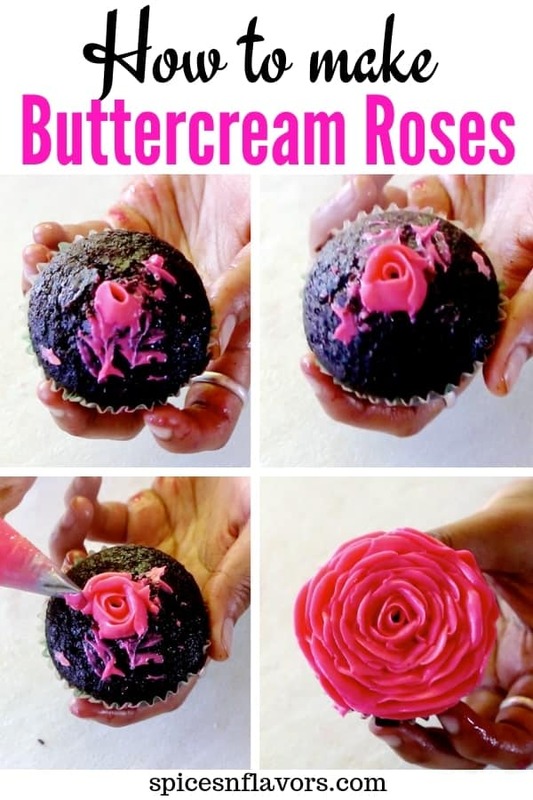 However, to make buttercream for flowers, you should have the cream to be little denser and stiff so that it holds the shape beautifully and does not fall off. The denser consistency helps eliminate air bubbles and pipes thinner petals with really nice, crisp edges. To achieve that a method similar to that of making Korean Buttercream Flowers is followed wherein the butter and meringue are cold and then whipped until smooth. 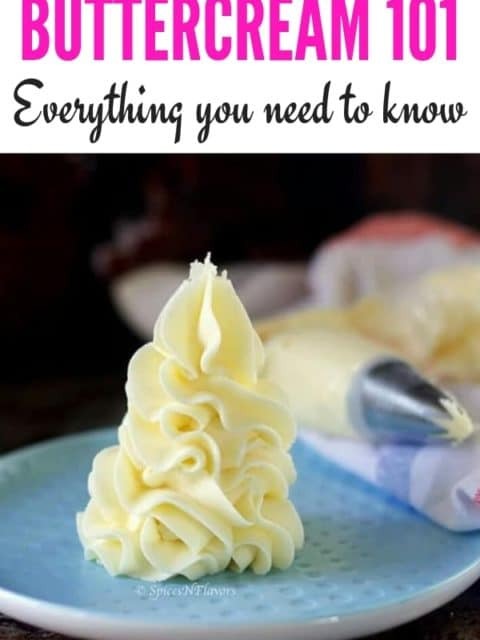 I am yet to try that method so for today we will stick to using room temperature butter and condensed milk to make this condensed milk buttercream frosting for cupcake decorations. I will share the method of how to make buttercream roses step by step format using American Buttercream in my Part 2 series. Coming to the consistency of our Condensed Milk Buttercream frosting it should be just smooth and silky, you absolutely don’t need to chill or refrigerate it. So now let us use this buttercream icing for piping. And you would definitely need some piping tips for the same right!! So I have divided it into 3 categories – Basic, Ninja and Pro. Basic as in the tips that you must own for making basic and simple buttercream flowers like Tip No 103. This is the most commonly used tip for making roses especially. With this same tip, you can make so many flower designs.. I have shared two today but this is one of the basic versatile tips that you need. The other basic tip to include in your collection is Tip 68 – Leaf Tip. I agree that buttercream cupcake flowers on its own look beautiful but with a little accent of leaves here and there it looks even more realistic. Tip 1M is one of my go-to tips for cake decoration. It is just perfect to pipe Buttercream Hydrangea. Coming to the Ninja category would be Tip no 120 or Tip No.122 These are similar to the 103 tips just that it is curved and that one is straight. So this is a perfect tip to make a closed bud for rose flowers or even peony. Now, these are not must-haves in your collection but with these, you can try different flowers other than the rose like CHRYSANTHEMUM or Dahlia. Again let me clarify I have not categorized these on the skill levels but actually on the must-have basic tips to some which you can buy at a later stage too. To make realistic and beautiful looking simple Buttercream Flowers I like to go with lighter tones of rose pink, yellow or simply white. The ones that you actually get in the bakery is actually too dramatic unless that is what you want to make like a really white cake and red rose – perfect for Valentine’s but otherwise I would prefer light or the ever trending pastel shades. When it comes to colouring less is more. So always start with a drop of buttercream or simply dip a toothpick in the colour of your choice and transfer that to the buttercream and mix well. The main reason to do this is that when it comes to colouring buttercream or any frosting for that matter, the colour darkens upon standing. So no matter what shade you begin with the next day the flowers would look a shade darker than what you actually started with. I have always used Gel Food Colours to colour my buttercream and I would recommend the same to you. The advantage of using gel food colours is that Gels are usually water-based which makes them a bit softer and being softer consistency makes them easier to measure in specific amounts like for example you can squeeze out one drop at a time. Buttercream Frosting of your choice – I have used Condensed Milk Buttercream Frosting here. Piping Tips – 103, 27, 1M, 81, 68. Start by applying a base coat of yellow colour onto the sides of your cupcakes. Holding the piping bag at an angle say around 30 degrees to the cupcake, apply some pressure to release the buttercream, leave the pressure while dragging the piping bag towards you at the same time to a height that you are satisfied with to create a pointed end. 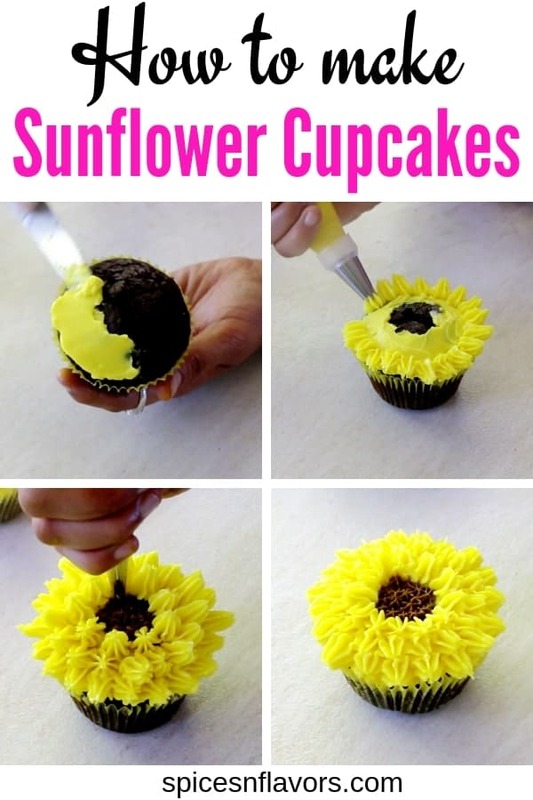 Repeat the process to complete one circle of petals on all around the cupcake. Holding the piping bag at an angle would give the petals a lifted look. You will be applying this little trick to all the other cupcake flowers too. To create the second layer of petals, the starting point would be the centre of two petals. Refer the attached pic below for clear understanding. Again this would be the same trick for all the other flowers too. Repeat the above step to create this inner circle of petals. So for piping the pollens we would use a small star tip say Tip No 13 and simply pipe the centre of the cupcake. And there you have it beautiful Sunflower Cupcake. This is one of the easiest and my personal favourite way of decorating with buttercream. Looks so intricate and complicated right with the purple petals and simple while centre but you will be surprised to learn how easy it is to make one. To a piping bag fitted with your nozzle add in the purple buttercream. With the back of your spoon spread the buttercream onto the sides of your piping bag creating a hollow centre. Fill in the hollow centre with plain or white coloured buttercream. PRO TIP: In your mixing bowl squeeze out a bit of the buttercream until you actually start seeing two-toned colour coming out. And then to make the flower pattern on the cupcake, simply apply pressure to release the buttercream. In this case, there is no need to drag them. Just like magic, you would get that purple petals and white centred effect. Not sure what these flowers are called since we are using petal tip I have named them so. Pro Tip: When you reach the inner circle make sure to pipe in odd numbers by counting to exactly 5 or 7 petals. To pipe this petal flower cupcake we need to follow an inverted “U” shape pattern. So starting from the left-hand side apply pressure to make an arch coming to right-hand side creating an inverted U shape. Continue the same pattern throughout the circle. Make 3 circles in total. I had also used this method to make a pattern on the entire cake once while I was making a Pineapple Cake for a friend. Attaching the picture of it for you guys..
For making this particular flower you will have to start by applying pressure drag upwards but while releasing, release it in a curved motion so that it stands upright..
Repeat the entire circle until you reach right to the centre. Please remember to change the angle with each inner circle so that by the time you reach the centre it is almost 90 degrees to the cupcake. 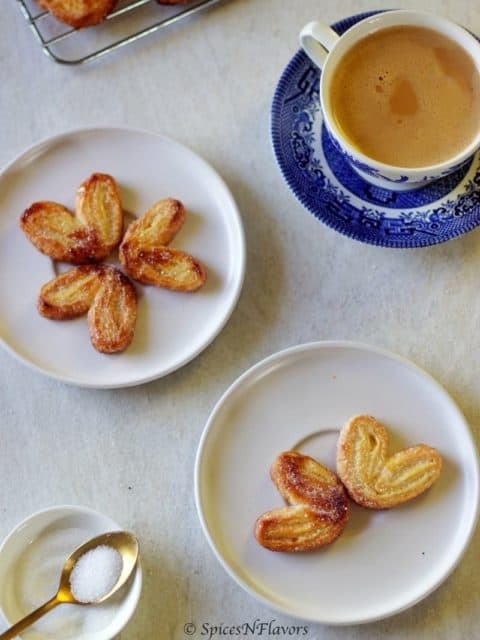 Start by piping a dollop in the centre to create a bud. The first inner circle has to have 3 petals. The technique is like creating an arch from left to right overlapping the first arch. Likewise, the next circle needs to have 5 petals. Create small petals in the beginning and as you reach the very end the petal size increases. And that was the 5 different Buttercream Flowers that we were trying to learn today. A step by step pictorial and video tutorial to making different types of BUTTERCREAM FLOWERS for cupcakes and cakes using tips and techniques that is perfect for beginners. Beat the softened butter until smooth creamy and paler in colour. Add in the condensed milk and beat until stiff. Next in goes the vanilla essence. Beat that well too. Your condensed milk buttercream frosting is ready. Divide it into separate bowls and colour it as per your needs by just adding a drop at a time. 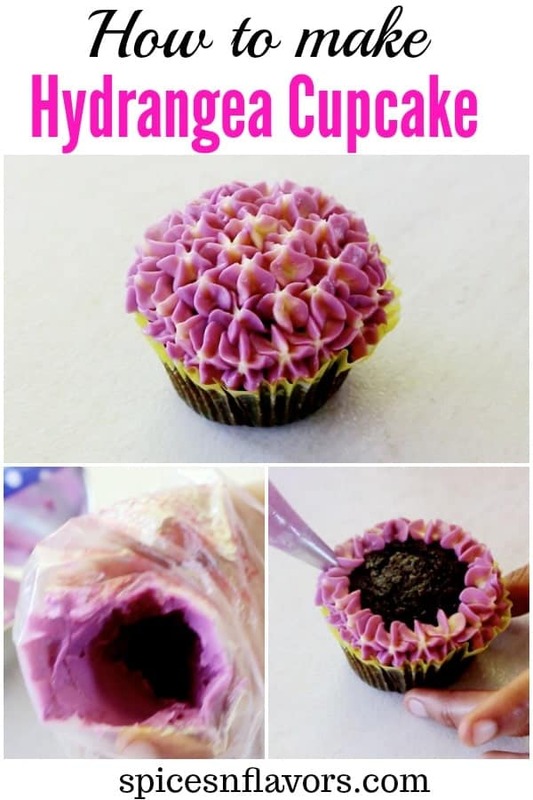 Make flower patterns following the step by step method as mentioned in the paragraphs above using the specific tips or nozzles or you can also follow the video tutorial attached to the recipe card. I have used my favourite vegan cupcakes recipe as the base. You can also choose to use milk in place of water in that recipe to get a more moist and soft cupcake as I did in this recipe. Find a detailed recipe of BUTTERCREAM 101 by clicking here. Practise is the key to pipe beautiful flowers on a cupcake. So don't feel bad if you could not make it in the first go, practise and practise until you perfect the art. 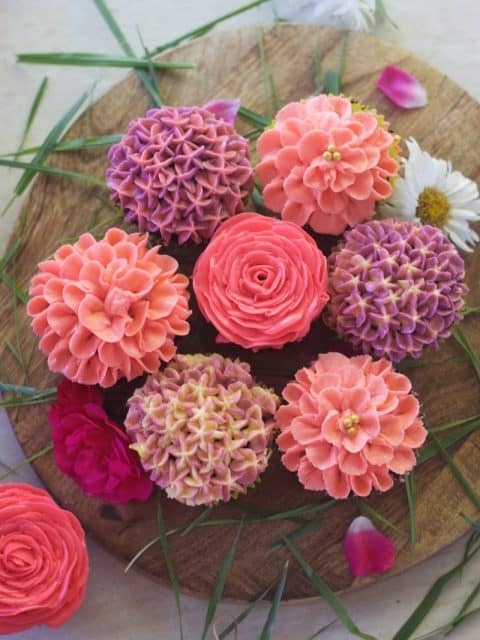 How to make Cupcake Flower Bouquet? One of the best things to make with buttercream flower cupcakes is a bouquet. Start by covering the cake board with fondant. The pattern to arrange the cupcake flowers is 2-3-2. That is first place 2 cupcakes, then 3 cupcakes below them and then 2 cupcakes to create a circle of 6 cupcakes with 1 cupcake in the centre. Roll the green fondant to create stems. Cut out green fondant using leaf cutter to make leaves or simply pipe using a leaf tip. I hope you found this tutorial post helpful. If you recreate any of these flowers or if you found these instructions informative then definitely let me know by tagging me, tweeting me or Instagram me. I would love to follow you and your posts. Nice to meet you on blogosphere Sushma. I stumbled upon your videos while checking for buttercream frosting. You have beautiful website and love the easy tips and tricks along the way. I just entered blogosphere and still leaning many things along with photography and styling of the website. I am glad to get to know you thru your about me page. Good Luck. I will keep checking your website. so good to connect with you through this medium.. Thank you for dropping by.. just visited your blog too.. It is so good.. so clean and welcoming.. all the recipes seems so easy plus the pictures are awesome.. I am pleased to learn that you liked my videos and the tips and tricks that I share.. thank you for sharing that appreciate it..
Hope to see more of each other in the future..